Front of the recipe card for Summer Squash Casserole. 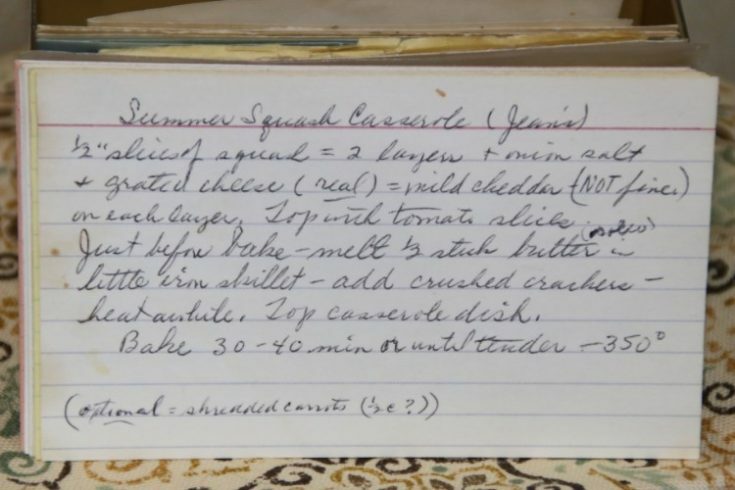 There is a notation that the recipe is from Jean, who we do not know who that is at this time. 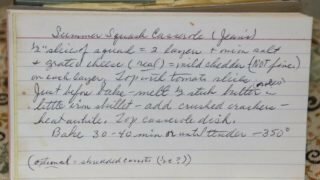 There are lots of fun recipes to read in the box this recipe for Summer Squash Casserole was with. Use the links below to view other recipes similar to this Summer Squash Casserole recipe. If you make this Summer Squash Casserole recipe, please share your photos and comments below! ½" slices of squash = 2 layers & one in salt & grated cheese ([real]) = mild cheddar (NOT fine.) on each layer. Just before bake - melt ½ stick butter. Little rim skillet - add crushed crackers.